According to l'Ordre professionnel de la physiothérapie du Québec (OPPQ), 50% of teens aged 13 to 16 years complain of back pain at least once a month in Quebec. Choose a backpack that has a padded back, shoulder straps and buckles in the chest and waist areas. Make sure it fits squarely on both shoulders. Do not allow for much movement or the weight to rest on your lower back. Adjust and use all straps so that the weight is evenly balanced. Avoid wearing it on only one shoulder. Place heavier objects in the middle of the bag and close to your body. The bag should not exceed more than 10 % of the child’s total body weight. 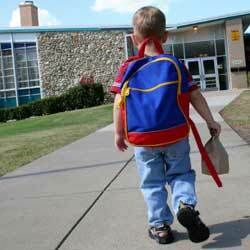 Remind children and teens to empty their backpacks regularly, and to remove any items that they don’t really need. For detailed information from OPPQ about backpacks, click here.